NOTE: This cargo bag could not be used in heavy rain condition. It is not totally waterproof. -Try to place them in the middle, start with the largest or heaviest items first at the bottom. -Try to keep the cargo relatively balanced. -Do not place the sharp object in the bag. -Finish the loading process by zipping the roof bag closed, make sure the zipper flap is completely flat against the zipper. High capacity - The roof bag overall size is 63''x43.3''x19.7''. Expand the carrying ability of your car for more 30 cubic feet. Anti-moisture and dustproof - The roof bag is made of 600D Oxford. It is crafted from rubber laminated nylon, double- sealed seams are sewn for strength,welded to block out moisture. (NOTE: NOT for heavy rain condition)The zipper also has its own built in protective layer on top which built on the flap rather than on the bag, protect your gear and luggage from rain and dust on the road. Universal fit - Comes with anti-slip & scratch-resistant soft layer on the bottom to avoid scratching car paint. 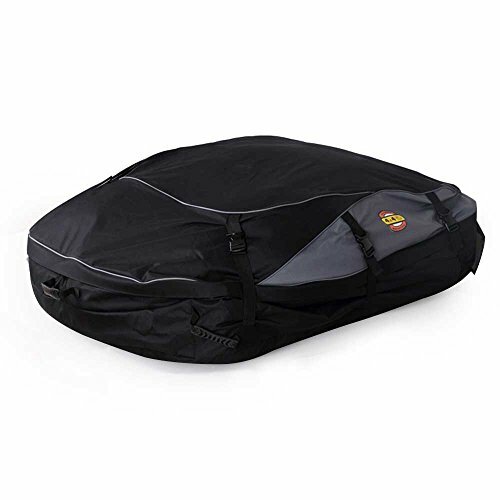 Our car cargo roof bag applies to the vehicle with or without the rack. Take the cargo bag to the park, the beach, the sports field, or any place you need to be storaged,the carrier bag for vehicles which with roof racks or rails in the top of the car, which like,suitable for cars, vans, SUVs,etc. User friendly design - Comes with the strong wide straps and snap joints to ensure that everything stays in place even on rough and bumpy road. Easy to collect - Soft and foldable. It also comes with the storage bag for easy storage. If you have any questions about this product by Wisamic, contact us by completing and submitting the form below. If you are looking for a specif part number, please include it with your message.